Cuttings may be rapidly rooted in either 100% Aero-Soil horticultural perlite or a mix of 3/4 perlite and 1/4 peat moss. Rooted cuttings can be easily removed from the media without causing root damage which lessens transplant shock. The media should be kept moist, and transplanting should not be attempted until a sturdy, well-formed root system has been developed. Aero-Soil horticultural perlite can make turf areas more resistant to compaction and improve drainage. Because of the superior water exchange properties of Aero-Soil, less frequent watering is required. In addition, turf areas that have been treated with horticultural perlite will recover more quickly after use. Aero-Soil can be used to advantage in the planting of new lawns as well as in the upgrading of established lawns. For new lawns, a one-inch layer of Aero-Soil should be tilled into the top 4 inches of soil. The lawn may then be sodded or seeded following seed producers recommendations. It also improves the texture of clay soils by increasing aeration and drainage and improves the water holding ability of sandy soils. 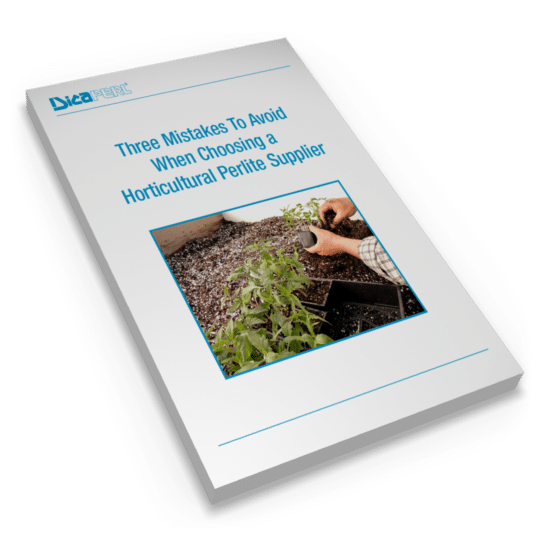 Extensive research has shown that superior crop yields result when horticultural perlite is used as a growing medium. In addition, since perlite exhibits a unique water exchange ability, over-watering and under-watering problems associated with such materials as rockwool are reduced or eliminated. This reduces plant stress, greenhouse labor, and irrigation costs. Typical crops grown hydroponically in horticultural perlite are lettuce, cucumbers, tomatoes, arugula, basil, and strawberries. When planting shrubs and trees, dig a hole 10-12 inches wider and six inches deeper than the root system. Set the shrub or tree in position, and add 1/3 Aero-Soil, 2/3 soil mix tamped into and around the roots. As the hole is filled, the mix should be thoroughly watered. Aero-Soil is an ideal material to use when storing bulbs, corms, and tubers over the winter. 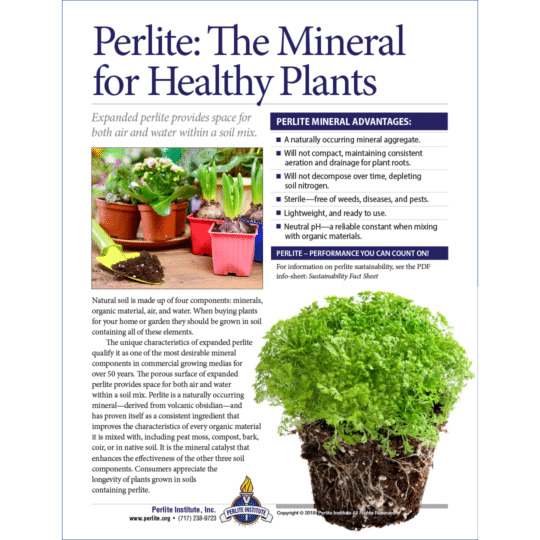 The perlite prevents excessive drying, eliminates dampness, helps insulate bulbs or tubers against rapid temperature changes, and reduces damage from rodents and insects.